Dugin is considered to be the godfather of Eurasianism, one of the most popular variants of National Globalism. Dugin was born on January 7, 1962, in Moscow, in 1979 he attended the Moscow Aviation Institute, an engineering education university. He was a dissident and anti-communist during the Soviet-era and joined later the Christian Pamyat-group. In the 1990s he helped to create a reformed Communist Party of the Russian Federation led by Gennady Zyuganov. Dugin was one of the co-founders of the communist-fascist National Bolshevik Party in 1993 together with Eduard Limonov and Yegor Letov, which still existed until 2007 when the party was banned by the authorities. He is a member of the Old Believers, a sect of the Russian Orthodox Church considered heretical by the latter. 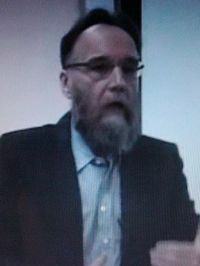 Dugin's view on international politics were frequently criticized by Western liberals especially when it came to his anti-Western rhetorics, therefore, his points can be criticized and discussed when he stated that "by no means the racist and chauvinist aspects of National Socialism that determined the nature of its ideology. The excesses of this ideology in Germany are a matter exclusively of the Germans ... while Russian fascism is a combination of natural national conservatism with a passionate desire for true changes." and despite that he said that "American liberalism must be destroyed" he is nothing more than a left-wing political scientist with some conservative tendencies. "Everything except war and friendship is good for us in Russia-US relations;"
and advocating a Russian alliance with globalist entities such as the European Union and China and even Islamism to contain the United States. ↑ Dugin, Alexander (January 18, 2018). Globalisation And Its Enemies. Geopolitica.ru. Retrieved August 30, 2018. This page was last modified on 30 August 2018, at 14:31.